FINAL SALE. 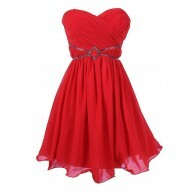 This stunningly beautiful dress will have everyone asking where you found it! The One Shoulder Embellished Chiffon Designer Dress comes in two great color choices. It is fully lined and crafted of fluid chiffon fabric. The top is crafted of pleated chiffon and has a lined and lightly padded bust. The asymmetrical one shoulder style of this dress will definitely get you noticed. The empire waistband is decorated with sparkling sequin and bead embellishment and the attached skirt in a contrasting color has a flouncy fit and flare shape. The One Shoulder Embellished Chiffon Designer Dress is truly a knockout! It would look perfect paired with black pumps or strappy heels and a clutch. You’ll be the best dressed at any event you attend wearing this little number. Also available in Black/Vintage Rose. You have added One Shoulder Embellished Chiffon Designer Dress in Cream/Black into Wishlist. You have added One Shoulder Embellished Chiffon Designer Dress in Cream/Black for Stock Notification. You have set One Shoulder Embellished Chiffon Designer Dress in Cream/Black as a loved product. 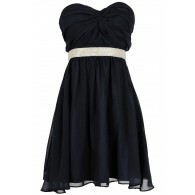 You have removed One Shoulder Embellished Chiffon Designer Dress in Cream/Black as a loved product.